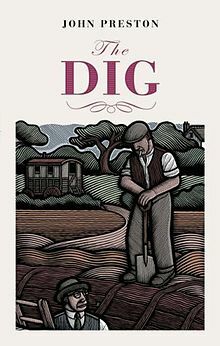 We’ve just read The Dig by John Preston, and it had all the makings of a fast paced and taut novel with real historical characters. It is based on a true story set just weeks before the Second World War in the summer of 1939, and it involves one of the greatest archaeological finds in Britain and retells a true story. One of the members of book group stated that it is ‘a little gem’ which admittedly is contrary to my opinion of the book. The story is split into different narratives from the perspective of three characters: ageing Mrs Pretty -the landowner who spurred the dig, local archaeologist Basil Brown and Peggy Piggot, wife of Stuart. Each narrative ignores the other characters, providing three distinctive perspectives on how this archaeological discovery deeply affected very different people. Preston subtly places the story against the thunderous backdrop of the forthcoming Second World War; the looming war provides a drive for the excavations to be completed quickly. East Anglia, the site of the excavation, is close to the continent and the anticipated war – and the Great War is still within living memory. Robert Pretty, son of Mrs Pretty, was a fantastic character whom Preston used to draw out the gentler characteristics of personalities – either opaque or harsh. Mrs Pretty worries about her son, concerned about the isolation of his life, but the arrival of archaeologists and local men from the village provides him with a focus. Robert also wraps up the story with a nice epilogue. Quite a lot of our discussion was centred on archaeology and archaeology of the period. A couple of our members had experience of going on ‘digs’ and actually discovering a Roman coin! We discussed the excitement of ‘digging up the past’ but also the psychological impact of finding and owning archaeology. The Sutton Hoo hoard is a wonderful trove to behold; you can see it at the British Museum any day of the week. Sutton Hoo also changed the perception that the dark ages were an age of cultural deprivation, where all Roman ideas were lost and the people of Britain reverted to a pre-Roman occupation period. A majority of the group really enjoyed the book. I didn’t, but only very rarely do we read a book that we unanimously enjoy. For June we’re reading is All the Truth That’s in Me by Julie Berry. We’ll be meeting on Thursday 25 June – join us!